Liczba stron: 25 Jest to ujednolicona liczba stron, która ułatwi Ci porównanie długości książek. Każda strona Legimi to 200 słów. Readers of Factfulness: Ten Reasons We're Wrong About the World--and Why Things Are Better Than You Think seeking engagement for all reading groups can gain further insight with this essential resource as a guide to aid your discussions. 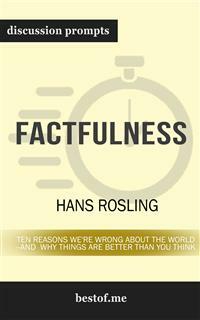 New York Times bestselling book Factfulness: Ten Reasons We're Wrong About the World--and Why Things Are Better Than You Think is written by the global TED phenomenon Hans Rosling. He defines factfulness as ‘the stress-reducing habit of only carrying opinions for which you have strong supporting facts.’ In Factfulness, Rosling, a Professor of International Health, offers a radically new explanation to the simple questions about global trends. He explains why this happens. He also reveals the ten instincts that collectively distort our perspective. Bill Gates says that Factfulness: Ten Reasons We're Wrong About the World--and Why Things Are Better Than You Think is “one of the most important books I’ve ever read.” Gates says that this book is “an indispensable guide to thinking clearly about the world.” In this comprehensive look into Factfulness: Ten Reasons We're Wrong About the World--and Why Things Are Better Than You Think, you'll be equipped to prepare with the following: Discussion aid which includes a wealth of prompts and information Overall plot synopsis and author biography Thought-provoking discussion questions for a deeper examination Creative exercises to foster alternate “if this was you” discussions And much more! Note to readers: This is a companion guide based on Factfulness: Ten Reasons We're Wrong About the World--and Why Things Are Better Than You Think. This is meant to enhance and aid your reading experience, not to replace it. We strongly encourage you to purchase the original book before purchasing this unofficial companion guide. Have you ever wanted to improve your understanding of Factfulness? Or perhaps you are simply struggling to learn the subject matter? It’s a simple teaching technique that helps students learn and readers to grow. With versatile discussion questions for each major criteria regarding Factfulness, these discussion prompts are designed to help surface crucial discussions that are capable to assist toward thinking and learning on a deeper level.